A first Stride for Pale Moon (and specifically Magia) has been revealed today. AUTO: [Counter Blast 1 & Choose 1 of your Rear-guards, place it into the Soul] When this Unit is placed on (VC), you can pay the cost. If you pay it, choose 1 card from your Soul, Call it to (RC), during that turn it gains Power+2000. If you call a Unit with the Magia ability, you can Soul Charge 1. For Today’s Card from the 3rd Character Booster “Rummy Labyrinth in the Moonlight” (on sale March 3rd, 2017) we’re introducing a 《Pale Moon》 G Unit that supports 【Magia】: “Kurdelis Dragon Master, Janet”. “Masked Phantom, Harri”, included in “Rummy Labyrinth in the Moonlight”. you can Soul Blast to Call 1 Unit from the Soul, and if you calla Unit with the Magia ability using “Janet”, you can recover the Soul you lost. With “Cutie Paratrooper” and “Flying Peryton”, you can combine them with the Right and Left Rear-guards with the Sride Skill allowing you to use multiple 【Magia】, you’ll be fine to use their abilities! “Rummy Labyrinth in the Moonlight” contains many Units that strengthen 《Pale Moon》, so look forward to further information! 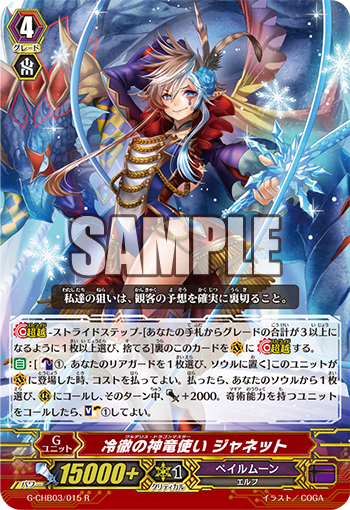 Now, today’s “Weekly Vanguard News Bits NEXT” will introduce a Generation Rare card from “Rummy Labyrinth in the Moonlight”! So be sure to check it out.